The backbone of the Byzantine army when it dominated the Mediterranean was the feared cataphract. But what exactly- as Joseph asks- was a cataphract? 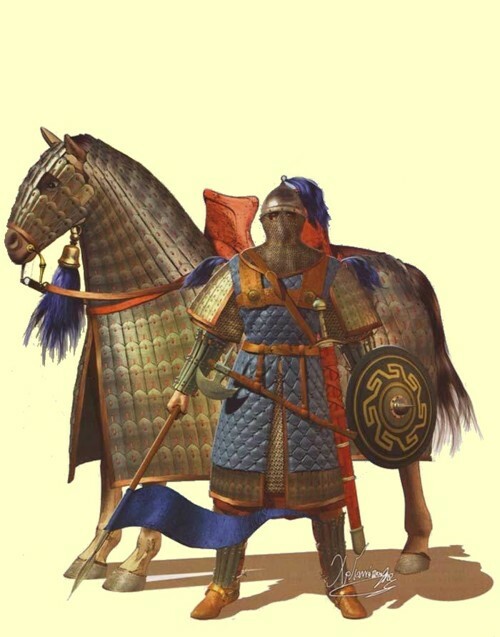 The short answer is the Byzantine version of the knight on horseback. The Roman term was clibanarii which somewhat hilariously translates as ‘furnace’- probably an apt description of what it felt like to wear the armor on a sunny day. There were three protective layers to bake in. 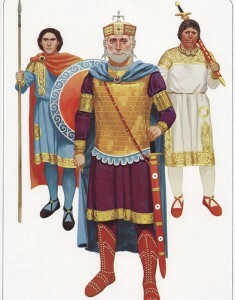 The first (peristhethidion) was a padded leather jacket with short sleeves (a pair of greaves covered the arms) and a padded skirt faced with mail or scales to protect the legs. Over that was the klivanion, a mailed covering of the chest and shoulders, complete with a metal helmet hung with mail to cover the face (excepting the eyes). The final layer was the epilorikion, a padded cotton or thickly-stitched silk surcoat which would identify rank or unit. The poor horse- who had to carry this weight- was also covered with an iron headpiece and a thick ox-hide or laminated felt draping. The cataphract carried a small round shield and a relatively short spear (roughly 8 feet long). In addition to this they carried two swords- one slightly curved, the other straight and double-sided. Some also carried a short bow or various kinds of maces and axes. For the Roman empire they were never more than a small, peripheral force. The late 4th century document Notitia Dignitatum which records the administrative organization of the imperial armies mentions that there were 9 units of heavily armored knights, which means that they made up roughly 15% of the field army. They seem to have gradually faded from use (completely vanishing by the 7th century) until their sudden emergence as the preferred troops of the terrifying emperor Nicephorus Phocas. In fact, most of what we know about them comes from the military manual that the emperor himself wrote (Praecepta Militaria) around the year 965 AD. But their renaissance proved short. Nicephorus’ (eventual) successor Basil the Bulgar-Slayer seems not to have used them, largely replacing them with his newly created Varangian Guard. After the military disaster of Manzikert in 1071, the imperial armies were largely mercenary and far less formidable. With the brief exception of the army of Manuel Comnenus, the empire never fielded a significant land force again. Ryan asks what the two “halves” of the Roman Empire (German and Byzantine)- thought of each other. The word ‘dysfunctional’ about sums it up. Their relationship over the six and a half centuries of their co-existence was perpetually stormy: two empires (neither of which controlled Rome) arguing over who was really ‘Roman’. Generally speaking, the Byzantines considered Charlemagne and his successors to be jumped-up barbarians, uncouth boors pretending to be something that they were clearly not. Constantinople tried its best to pretend that the Holy Roman Empire didn’t exist, and when power politics made that impossible, they reluctantly admitted that the German monarch was an ‘emperor’ (though not a Roman one). The Franks for their part, acted like a younger sibling. They viewed the ‘Greeks’ as soft, effeminate, easterners, unworthy of the name ‘Roman’, but were at the same time a bit insecure and jealous of the older empire’s greater legitimacy. They at first stopped calling themselves Roman to appease Constantinople, and even when they resumed the claim, German monarchs would occasionally cross the border in southern Italy (where the two empires touched) to seek formal recognition of their titles, and ask for marriage alliances. This finally paid off in 972 when the Byzantine princess Theophano married the German emperor Otto II. Their son- Otto III- was therefore a union of both crowns and was probably the best hope for a reunification of the old Roman Empire. Unfortunately, however, he died of a fever at age 21 and the empires resumed their antagonistic stances. There was one more brief moment of cooperation. During the reign of the pro-western Manuel Comnenus, the German emperor Conrad III led the (disastrous) 2nd Crusade through Constantinople. The two became close friends, with Manuel personally nursing his brother-monarch back to health after an injury suffered during the campaign. But when they exited the scene, relations quickly soured. The terrifying Frederick Barbarossa (Conrad’s successor) threatened to sack Constantinople and throw its emperor into prison, and several of his successors invaded Byzantine territory. The Holy Roman Empire never succeeded in getting Constantinople to recognize it as an equal, but it did outlast it. Though its power largely collapsed in the 13th century, the empire limped along until the 19th, finally being swept aside during the Napoleonic Wars. Before it disappeared, however, it had one last parting shot at its (by now) long dead adversary. In 1557, the German humanist Hieronymus Wolf published a history of the medieval Greek world. Not wanting to refer to the impostors in Constantinople as ‘Roman’ (since the real Roman Empire was in Germany) he coined a new term for them.